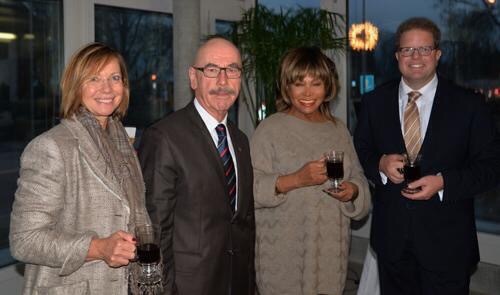 Birthday girl Tina Turner made a rare public appearance (although no TV or cameras were allowed) in Zurich to switch on the new Christmas lights she offered to her town of Kusnacht ! Looking gorgeous, it’s hard to believe the Queen of Rock is turning 75 today! Happy Birthday again TINA! And because it wouldnt be a real birthday without a video montage, here is one created by Drew! Ben & Sjef merci… Pour ces moments de tendresses et d’amour avec Tina. Je vous aime…. Encore merci pour le travail du site. Bises Kiss…. HAPPY BIRTHDAY TINA. YOU ARE THE BEST. Still “Simply the Best” Congratulations ! pourquoi je ne peu plus traduire en français!! Happy bday my mum, may God bless u always! All my love, admiration and respect for you Tina !! I wish the best in the world for you, you have a lot of health, and realize the dreams being dreamed .. always dream! Many years of full and happy life ! !Kisses from the Brazil!! excellent anniversaire TINA, j ‘ ai vu ,il y a dejà quelques années votre show à BERCY, à PARIS, ce fut inoubliable.respect. Hapy birthday Tina, you are my favourie artist and I Iove performing like you. Reblogged this on Espacio de NATALIA. Beautiful journey allowed Amazing Grace to bring the joy of Christmas lights to your new home. Next PostNext They Celebrated Tina this week!